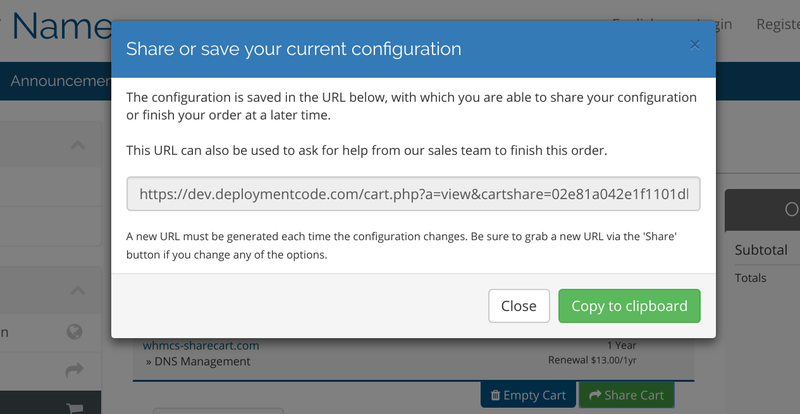 With this module your customers can share the cart or save it for later. Furthermore, it is possible that the employees share a shopping cart. This is ideal if the customer wants a ready-made solution, but can not find his way. Customers can save their shopping cart via a link and access it at a later time without having to add and configure all products again. Customers can show their cart via link to other team members, making it easier to review the order. Everyone can change the basket and divide again. The support staff can help the customer with the order. The customer can show support his basket and the support can customize the basket and then send the new shopping cart link to the customer. You can create ready-made shopping cart links and then advertise them. This simplifies the shopping experience and customers can complete their order faster. Please send an email to support@deploymentcode.com if you couldn’t find an answer to your question here. Is the module compatible with all products? Yes, absolutely all configurations and products are supported. Can I change the look of the module? Yes, you can edit the template as you like. You can customize the whole template. Can I insert the share button myself? Do you want to buy Share Cart For WHMCS?